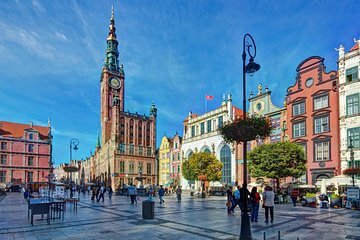 When your cruise ship drops anchor in Gdynia, maximize your time in Poland on a half-day shore excursion to Gdansk. Ideal for lovers of history, this tour covers Oliwa Cathedral, dominated by an enormous and elaborate organ, the Monument to the Fallen Shipyard Workers, and Gdansk Old Town, one of the largest historic centers in Europe. See architectural highlights such as the Neptune Fountain, the House of Uphagen, and St. Mary’s Church on a walking tour, and enjoy the convenience of port pickup and drop-off. Greet your driver-guide at the Port of Gdynia and board an air-conditioned minivan destined for the medieval delights of Gdansk. Following an approximately 30-minute drive, you’ll stop at Oliwa Cathedral, a Baroque basilica home to an enormous organ decorated in Renaissance style, to admire its 23 altars. Then, continue to Gdansk Old Town — stopping to admire the Monument to the Fallen Shipyard Workers of 1970 along the way — for a walking tour. Wander down Long Market, the area’s principal street, admire the Neptune Fountain and the 14th-century Gothic city hall, and the impressive St. Mary’s Church. Other Old Town highlights come in the form of the 12th-century Green Gate, the cobbled Mariacka Street, and the Historical Museum of Gdansk. Following the walking tour, you’ll have an hour of free time before returning to Gdynia. First part of tour dull. Second half of tour in Gdansk was great.